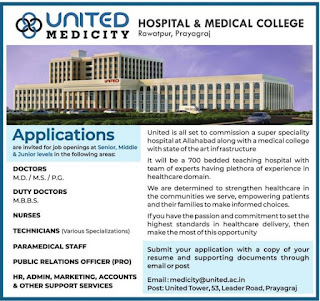 United Medicity Jobs 2019 If you are living in Prayagraj or Border District of Allahabad (Prayagraj Now) such as Lucknow, Kanpur, Noida, Varanasi Kaushambi than we have a jobs for you in department of United Medicity Hospital & Medical College Rawatpur, Prayagraj. Medical Jobs in Prayagraj: Application are invited to fill jobs of Staff Nurses, Duty Doctors, Technicians, Paramedical Staff Jobs, Public Relation Officer (PRO) and other Senior Middle & Junior Level jobs in the the following areas of United Medicity Jobs. 2.Duty Doctors: Qualification will be same as above posts. 3.Nurses: B.SC Nursing, ANM GNM type course or Post Graduate in Nursing Areas. 4.Technicians: Lab Technician, X Ray Technician, OPD Technician and other technician that required in Parayagraj Medical Latest Jobs May June Month. 6.Public Relation Officer (PRO Jobs in Medical): Should have good knowledge in Management Fields. 7.HR Admin Marketing Accounts & Other Support Officers. About United Medicity Jobs Opening For Freshers: You have already heared about Medanta Medicity that is famous for its Service Multi Super Speciality Hospital, World Class Heart, Cancer That it may become replica of Medanta Medicity. 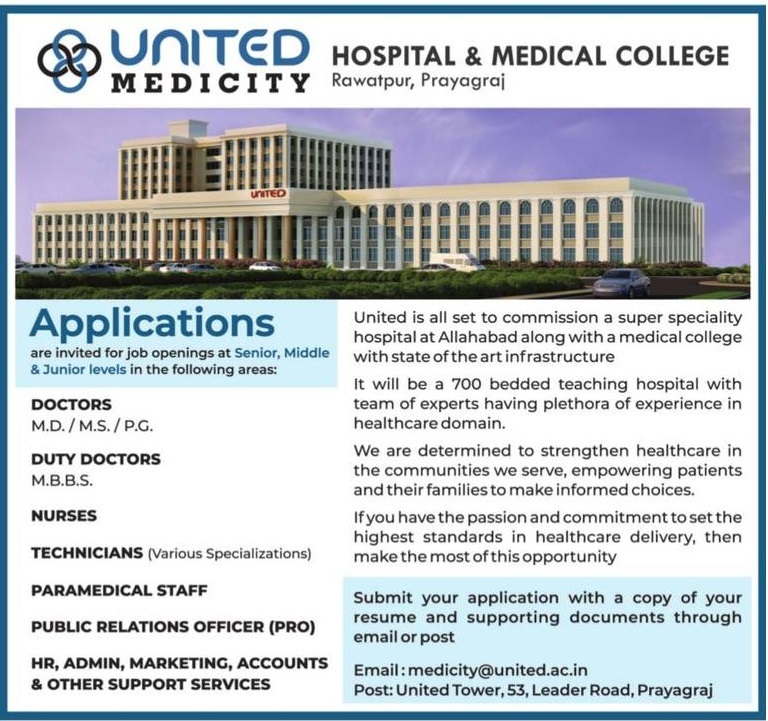 United Medicity Jobs: United is all set to commission a superciality hospital at Allahabad along with medical college with state of art Infrastructure. United Hospital Jobs: It will be 700 medical bedded teaching schools, hospital and team of experts having plethora of experience in healthcare domain. How to apply: Interested and Eligible candidates should have the passion and committement to set the highest standards in health care delivery, than make this opportunity. Submit your application with a copy of your resume and supporting documents through email or posts.